Yeah, I know, I’m supposed to wait for news to happen before talking about it. But I’m like a kid in a macabre candy-store, grabbing at the what-ifs in the barrel next to the door before my Mommy pays for them! Sadie has a pivotal parole hearing today. 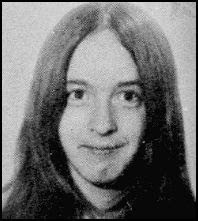 The first of the Hinman/TLB killers who is really on death’s door (they say) and because of her health status may be the first Manson Family murderer (after Steve Grogan, aka Clem) to be freed. But the birdie inside this cop’s daughter’s stomach keeps yelling “Parole Denied!” yet again, as if to finally put a legal cherry on top of the legal cake that says no mercy for the ones who gave none. Or maybe, that’s just my stomach wishing it were so. Can there finally be a time when killers of any murder should go free, despite the wanton, heinous nature of their acts? I’m not sure really. Maybe there are moral as well as legal lines drawn in society’s sand which say, “You cross over this one, buddy, and you’re persona non grata” if ya know what I mean. As who among us would agree to our loved ones being slaughtered like those poor victims in Los Angeles in ‘69? And who among us could approve of freedom for their killers at any time? Yes, there is such a thing as forgiveness and yes “Revenge Is Mine” sayth the Lord, but when is too much just too much? Several of the Manson killers have claimed that they are now political prisoners, and you know, I can’t really disagree with their charge. But who put these killers where they are right now? They did. And who did they take as their hostages with the fear they generated in 1969? Middle-class America, that’s who. We all were their political prisoners back then, so turn-about seems kind of fair play to me. Sure, that’s a very simplistic, very idealistic way of viewing this situation and I doubt this will be the way the Board of Prison Terms assesses Susan’s proposed release. I’m sure they will take all factors into consideration, especially her health status, if what her husband, James Whitehouse, says is true, that she is on her death bed, that aspect of their deliberation could weigh heavily in Susan’s favour. I would hate to be in the Board’s shoes today and I hope they’re wearing a sturdy outfit of chain-mail as the blows from either side of this issue will be hard and fast once the outcome is known. If Susan’s life is really at an end, then maybe her sentence should be too. But something keeps niggling at me that the Board may not see it that way. Hours, not time, will tell….